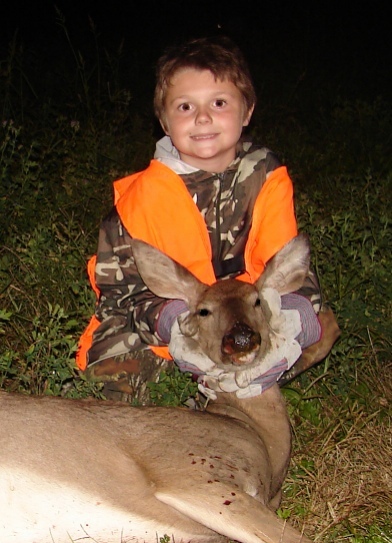 Here is a picture of my 9 year old son who shot his first deer during the Illinois youth season this past weekend. He made a good clean kill with the Savage muzzleloader with the Hornady #4500 300 grain HP .458 bullet (w/mmp orange sabots) at 100 yards. This is the first animal shot with the muzzleloader and I was very impressed with the knockdown power it has even when loaded fairly light with 42 grains of 5744. Shane only weighs about 80 lbs and had absolutely no trouble shooting the gun accurately and handling the recoil. He has shot out to 200 yards prior to season with very good accuracy. That's supremely good work from Shane. It won't be his biggest deer, but there is rarely any more important or memorable trophy than your very first one. One of the benefits of the Savage 10ML-II is the comparatively low recoil, as you don't have to burn a large mass of propellant to get substantial velocities. That's still a full-powered hunting load, around 2000 fps with a 300 grain projectile. Not much is going to live on the difference. When the 10ML was first developed, 36 grains of Accurate 5744 was considered a full-power hunting load. It was; it was also about all that earlier sabots could take and yield superior accuracy. Sabots have improved in strength considerably since then. The 36 - 38 gr. Accurate 5744 route is still an excellent path for those looking for extremely low recoil loads. Congratulations to Shane on his first deer. Actually, the load he is using right now will serve him well whether he is nine years old, or eighty-nine years old. That .45-70 bullet has done the job on whitetail for a very long time by now and I suspect it always will. It sounds like Dad and Shane got some good practice time in before the hunt, something that can pay big dividends. Great news for Shane! © Copyright 2003-2010 by Randy Wakeman. All Rights Reserved.